Batto is sort of a "retro" boat. Every now and then I go over another designer's older design and try to update it to the way I do boats. I always learn a bit. Batto is a close copy of the Pete Culler clipper bateau Otter which appears in John Burke's book PETE CULLER'S BOATS. Batto is only very slightly different in shape and size from the original Otter and is in no way intended to be a parody of it, only a reworking to the type of construction I prefer. Burke points out that the boat is about as close as you can get to a racing shell with traditional hull, and that it was unforgiving and cranky if improperly used and very elegant and fast if properly used. I would prefer it to be thought of an exercise boat meant for one. Supposedly Culler judged the boat to be safe to handle one third of a person by proposed Coast Guard regulations. I found Burke's book to be very good reading. The big departure I've made from Culler's work is that I've used "instant" plywood construction, something that Culler didn't like at all. He had a long lifetime of experience with traditional methods and tools and materials by the time he built Otter and Burke says he built her in a one week vacation, with lapstrake sides, cross planked bottom, and all the gingerbread. In the photos it is a true work of functional folk art. Batto won't be in the same league as a work of art, but it should actually be a better boat by almost all other criteria. Built taped seam style with no jigs from 3 sheets of 1/4" plywood, Batto will be a 40 hour project for most any man and will be lighter and faster than the original. 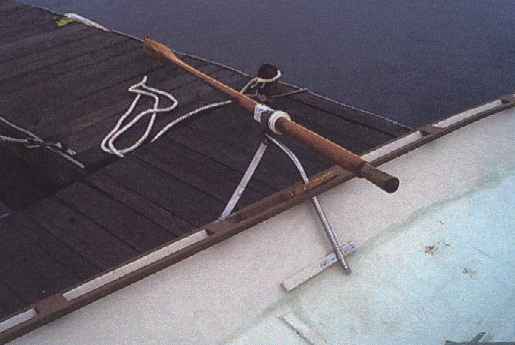 Culler used very long special rowlocks to get the proper oar location in the very low and narrow hull. (You won't be able to stand up in it.) That replaced the need for outriggers which, I can attest to, are a pain for a cartop boat. I think the Culler locks are worth a try, if only because they can be easily removed and replaced. For that matter the boat would take a sliding seat very easily. I'm certain Phil Bolger would quickly point out that locks tilted 45 degrees like these aren't worth a hoot. And he'd say that the hull needs more rocker. But I guess that shows how two very experienced designers can have very different experiences. 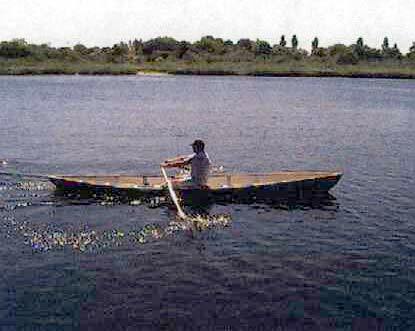 I know for a fact that the narrow Culler oars work very well although Phil never liked them. The prototype Batto was built by Ray Schaefer of Brooklyn, NY. He is a very experienced builder and oarsman. He writes, "Here is Batto in action, Harry Rasmussen test pilot. Slick as snot. Fastest fixed seat I ever rowed. It's a pleasure to row into a good wind and make good progress." 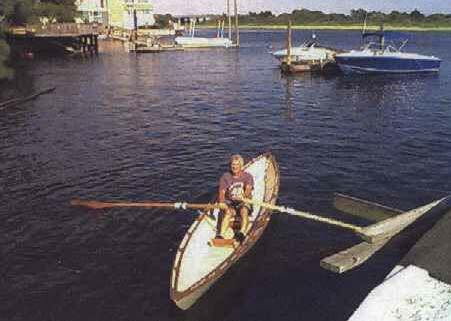 "Oars are Culler style 8'8" cedar and redwood with inboard looms not square anymore. Fitted 2" PVC in place of leathers and PVC collars, 2 more layers, additional pieces glued and faired for D shape. So far so good, not too many miles on them. Last 3 pair of oars fitted with lead counter weights as per Bolger/Montgomery, this pair 8 oz sinkers hammered to cylinders, epoxied in ends of handles last year. Works good. Anything helps as you get older." "Outriggers are 3/4" SS tube from cast off bow rail, tough stuff to bend cold with a hickey Slug of 3/4" x 1-1/2" welded in outboard ends, 1/2" thole pins welded to them for Bolger style locks. Lug of 1" x 1/8" SS welded under for 16 x 1 x 1/8 strut leading forward. One 1/4" bolt, loosen screws on 3/4" tubing clamps and lift out." He did elaborate on the construction a bit. Looks very nice!